On June 6 1952, police issued a report that the dim atmospheric lighting inside the Little Bohemia bar was too dark for the law. A city ordinance required that the inside of a bar must be visible from the street. Although customers were found to be "orderly despite the cloak of darkness," only six low-watt colored bulbs illuminated the place. No doubt police were suspicious that the eccentric clientele may be carrying on more than intellectual conversation. 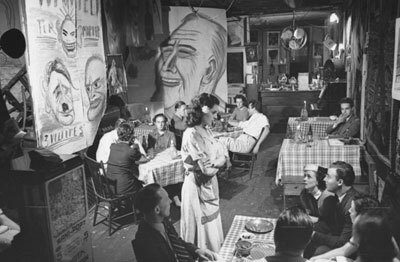 Popular bohemian public spaces were not a phenomenon unique to the 1950s; by 1952 Little Bohemia had been a hangout for avant-garde St. Louis for nearly twenty years. In 1934 just after Prohibition ended, Little Bohemia began a 25-year history under the ownership of the Radulovic brothers. Savo Radulovic's riverfront Little Bohemia was located next to the Old Rock House, on Commercial Alley near the foot of Chestnut Street. In late 1930s, when the city began demolishing the buildings of the old St. Louis riverfront for the Gateway Arch grounds, Little Bohemia moved to the Grand and Franklin Avenue artist's colony. Both Radulovic brothers were award-winning painters, and they attracted other artists, poets, writers, and musicians of the day including Carl Sandburg, and later Thomas Hart Benton, to Little Bohemia. In 1946 Stanley Radulovic moved Little Bohemia, now a saloon and art gallery, to 220 South 4th Street at Clark He co-owned the bar with Jay Landesman who would later own and operate the Crystal Palace in Gaslight Square. Little Bohemia featured the first art exhibit of national importance to be displayed in a bar. Radulovic's inspiration for his saloon-salon came from nationally-acclaimed Missouri artist Thomas Hart Benton, who said that he would do away with museums, where no one sees his work, and sell his work at saloons instead. St. Louis artists exhibited included Tanasko Milovic, Mike Chomyk, Aimee Schweig, and Fred Conway, with 600 in attendance for the opening. The unconventional atmosphere at Little Bohemia attracted mainstream St. Louisians as well as the more eccentric crowd. As Jay Landesman later wrote: "It wasn't only the paintings on the wall or the red-checkered table cloths with wine bottles and candles that people flocked to see; the real attraction was the people. The poet, writer, radical, nonconformist were no longer threatening outsiders in Little Bohemia, they were the star attraction, and the Establishment came to soak up the artistic atmosphere" Writer Michael Harrington was a youthful seeker of bohemian spaces in the late 1940s. He "found the seacoast of Bohemia on the banks of the Mississippi" at Little Bohemia where he enthusiastically "joined the painters and regulars . . . to talk about art and psychoanalysis and the motherland of Greenwich Village." Joe Pollack, columnist for the St. Louis Post Dispatch, when looking back on his unforgettable first visit to Little Bohemia, said that the seed for the whole Gaslight Square movement began with the Landesman-Radulovic team at Little Bohemia.